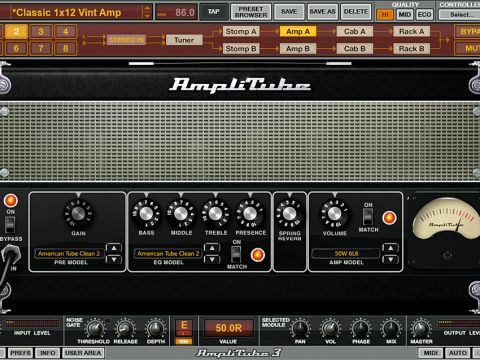 A great update that sees AmpliTube 3 hanging in there as one of the premier amp sims for tone, flexibility and choice. Loads of amps and pedals. Great sound quality. Excellent new cabinet miking system. Integrates all AmpliTube products. Doubles as a neat multi-effects plug-in. Choice can be overwhelming. Fully loaded racks can be CPU-intensive. 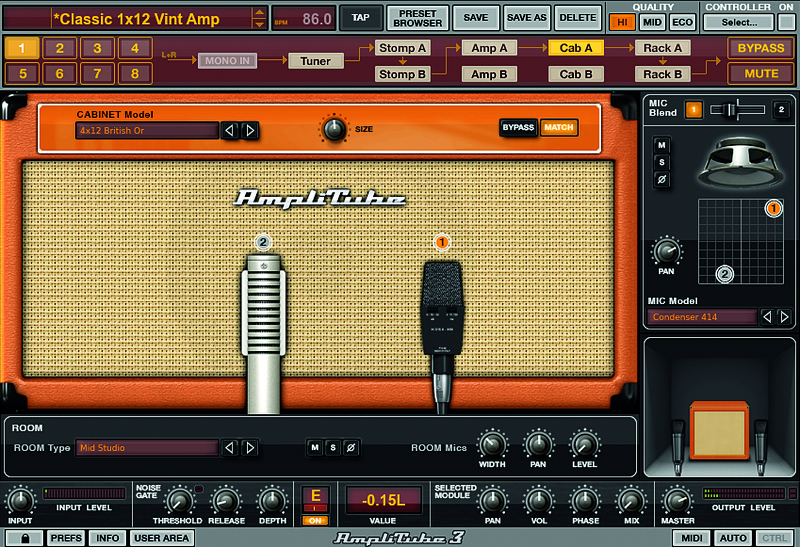 The AmpliTube series of amp modelling software launched back in 2002 and became an immediate success due to its solid tone backed up by a wide array of amps, cabs and effects, decent routing and slick graphics. We've since seen v2 and various 'spin-offs', such as the Ampeg SVX bass amp, Jimi Hendrix, Metal and Fender packages, and the X-Gear 'shell'. AmpliTube 3 builds on this success, combining an overhaul of existing features with the introduction of many new ones. On the technical side, modelling techniques first seen in last year's AmpliTube Fender are present, these being IK's third-generation Dynamic Saturation Modelling and Volumetric Response Modelling (used for rotary speaker effects). All existing AmpliTube 2 models are present in v3, but they've been reworked to improve efficiency and dynamic response. There are new models in v3 (amps, cabs, pedals and effects), including some from Metal and Jimi Hendrix, so you're now looking at over 160 modelled elements in total. The cabinet and miking section has received a substantial upgrade in terms of both choice and flexibility and both pedal and rack sections now thankfully include drag/drop and copy/paste functionality. Routing-wise, AT3 can now operate in full stereo mode, making it useful for general effects processing of non-guitar signals. Meanwhile, in standalone mode there's an expanded four-track recorder with track-independent timestretch, which serves as an excellent tool for learning parts. The greatest functional improvements in AT3 have been drafted from X-Gear. You can assign custom automation and MIDI CCs (up to 16 of each) using the context-sensitive menus or MIDI/Auto pages, plus there's built-in support for IK's StompIO and StealthPedal (of course, the forthcoming StealthBoard will also be fully supported). AT3 can access the modules of all other AmpliTube products that you own, too. They appear in categorised menus, effectively doing away with the need for X-Gear. It also prepares for the imminent arrival of model 'singles' (ie, amps, effects, etc, sold on an individual basis). 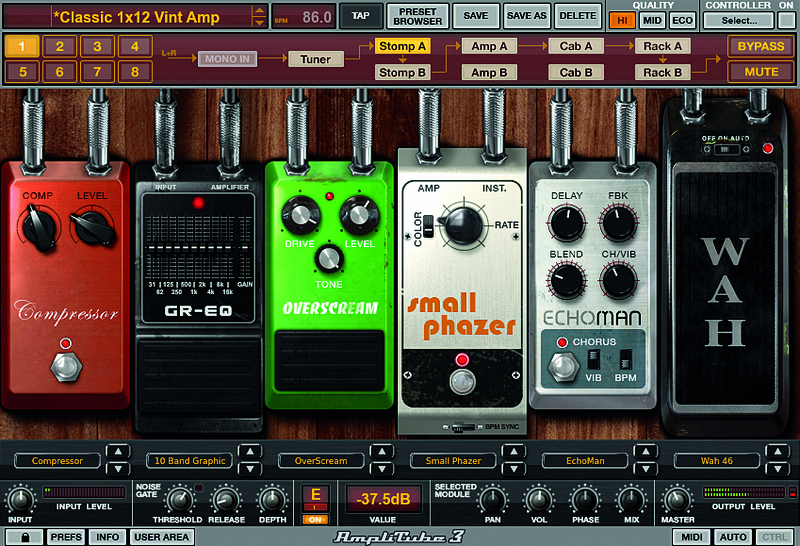 One of AmpliTube's big selling points has always been its variety of modules. New amps based on Orange, Mesa/Boogie and even bass designs, such as Trace Elliot and Gallien-Krueger, spread the net wider still, so you now have 31 amps in all. The pedals have also multiplied (now 51 in total), and to give you some idea of the breadth of selection, there are four types of wah wah, seven fuzz pedals and 11 distortions. New for the rack are the Step Filter, Step Slicer and Tap Delay. There are now 46 cabinets to choose from - that's 30 more than AmpliTube 2 - and these are categorised by style (guitar, bass, rotary) and size (6, 10, 12 and 15 inch). Finally, there are 15 mics, including three ribbon models. In fact, AmpliTube 3 has a much-improved cabinet and miking section. In addition to the many cab types, you now get two flexible close mics and a stereo room mic option. There are 15 close mics, which can be positioned anywhere in the left to right or near to far planes (though you can't change their angle). You move them by grabbing them or using the positioning graphic to the right. Pan, solo, mute and phase invert can also be selected individually and there's a mic blend slider, too. The stereo room mic is simpler and includes mute, solo and phase flip, plus width control, pan and level. Once again, you can adjust it using the controls or the graphic. You'll also find a selection of five room types: amp closet, small studio, mid studio, large studio and hall. Rounding things off is the cabinet size control. This enables you to artificially inflate or contract the size of the cabinet (75% to 125%). Overall, the new cabinet implementation is wonderful, and the only shame is that you can't import your own impulse responses into it. Moving on, there's a whole new set of presets to contend with, and a new preset browser page with various categories. Oddly, this didn't seem to incorporate patches from our other IK amps, which is a shame. Note that while AT3 replaces the models from AT2, you can still open your AT2 presets, although they may sound slightly different using the 'remastered' models. Like its predecessor, AT3's strength lies in mimicking rock guitar amps, and if you like 'dual rectified', US-style rock sounds, you won't be disappointed as the Mesa/Boogie, Randall and Peavey amps really deliver. Similarly, UK classics (AC30 and Marshall) have a strong presence, and the addition of more bass amps is also welcome. Fender amps are well represented, but there's enough differentiation from AmpliTube Fender for each to remain an attractive buy. For huge stereo rock guitars, the flexibility of the routing comes into its own (you can use two complete setups at once, and there are eight routing options), and we also had great success using the new amp miking system to combine spread mics with a touch of room sound. "Like its predecessor, AT3's strength lies in mimicking rock guitar amps." Pretty much every flavour of fuzz and distortion can be found in the pedals, while sweet swooshes and warm wobbles can be had with the Electro-Harmonix style Small Phaser and Electric Flanger, as well as the Uni-V, which is, of course, a Uni-Vibe imitation. Advocates of the crazy Digitech Whammy pedal will also be thrilled to set foot on the wild Wharmonator. With such a bewildering selection of modules, you'll be glad of the presets, and although some rely too heavily on the rack effects, such all-encompassing sounds can be pretty seductive and inspiring when jamming by yourself, making a good starting point. Sonically, IK have upped their game with AT3, as it's very much on a par with the outstanding AmpliTube Fender, yet offers a wider range of tones. The only downside is that complex patches can put the pressure on your CPU. However, you can reduce the quality of individual sections in the Prefs menu (as in previous versions), or use the new Eco, Mid and Hi front panel options to ease CPU load - these act much like Prefs combination presets. In recent times, an influx of upstart quality amp plug-ins has begun to chip away at the established names, but we reckon none of them offer quite the flexibility and choice of AmpliTube 3. Disputes will no doubt forever rage over which amp sim package sounds 'best', but you've got to hand it to IK for continuing to turn it up to 11.